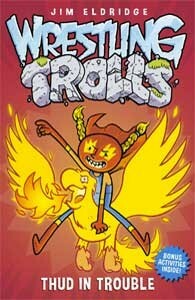 WRESTLING TROLLS is a brand new series of comedy-adventures in a fantasy land where anything, and anyone, is possible. 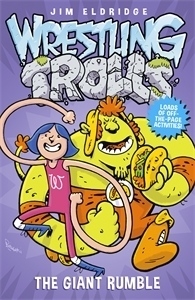 The heroes of WRESTLING TROLLS are BIG ROCK, a wrestling Troll, a massive lump of mobile rock on legs; with a gentle sweet soul inside his rough exterior; his trainer and manager: streetwise, cheerful 13-year old MILO, and 10-year old fragile orphan JACK … a boy with a Big Troll Secret. The fourth member of this “family” is ROBIN, the laconic and lugubrious talking horse that pulls their caravan from wrestling bout to wrestling bout. Jack knows every wrestling move there is to know, and his dreams come true when he’s recruited as a training assistant to Waldo’s Wrestling Trolls. Little does Jack know he’s actually part troll, and that when his new family is in trouble he morphs into the terrifying Thud! He’ll have to rescue princesses that don’t need rescuing, avoid ambushes by goblins, and most of all build a team of wrestling trolls to take on villainous Lord Veto’s evil orcs. With Waldo’s Wrestling Trolls winning matches, the troupe are recruiting. But can they trust the handsome half-troll Hunk, or is he more interested in how he looks than how he wrestles? And with a gang of grabbing goblins on the loose, will the elusive Wrestling Troll, Thud, turn up in time to save their kidnapped friend? With two epic wrestling stories in one, Jack and his friends are in for a real wrestling rumble! The villainous Lord Veto has challenged Waldo’s Wrestling Trolls to a Giant Rumble: ten against ten in one ring. If they lose, they will have to give up wrestling forever! Jack and Milo have to find more wrestlers to join the team – and quickly. With their new taco-eating and super-bendy wrestling friends, the team must outwit evil billy goats and poisonous spiders, but will they make it to the Giant Rumble on time, and alive? 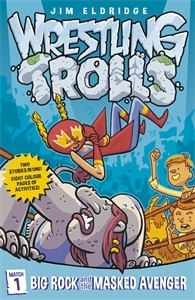 The Wrestling Trolls gang is just like a family to Jack: kind-hearted Big Rock, street-smart Milo, tough Princess Ava (aka The Masked Avenger), and the grumpy old horse, Robin. There is no way a bully or a devious villain could come between them … Or is there? In “Thud in Trouble”, the gang are pushed to their limits, both inside and out of the ring. Disaster has struck Waldo’s Wrestling Trolls. Their friend Robin has been stolen by a band of horse rustlers and it’s up to Jack and the gang to rescue him – but will the rustlers play fair? And when Jack leads his friends on a dangerous mission to recover a precious family heirloom from Lord Veto’s castle, will they find more than they bargained for? Jack has discovered that he’s a troll prince and in charge of the unruly troll kingdom – but he doesn’t even want to be king! As if the scrawny young boy didn’t have enough problems, Jack and his friends also need to vanquish an evil wizard, overcome monstrous guard dogs, and keep the Waldo’s Wrestling Trolls team together. 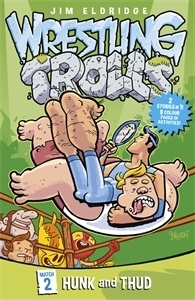 WRESTLING TROLLS are published by Hot Key Books.